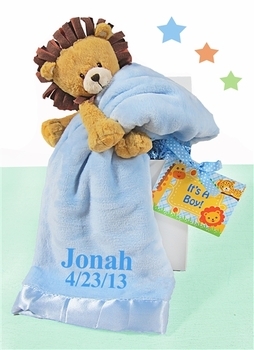 This blue blanket gift set makes a great gift for the newborn boy! Comes with a large (30 x 40) satin lined blanket of super soft minky fabric, you can also have the blanket embroidered with his name and birth date creating a special presentation and keepsake. Included is a little lion toy to help keep him entertained as well. Comes fully gift boxed.